ScreenFlow 7 will record your screen as it always has, but it now goes dramatically further than that. 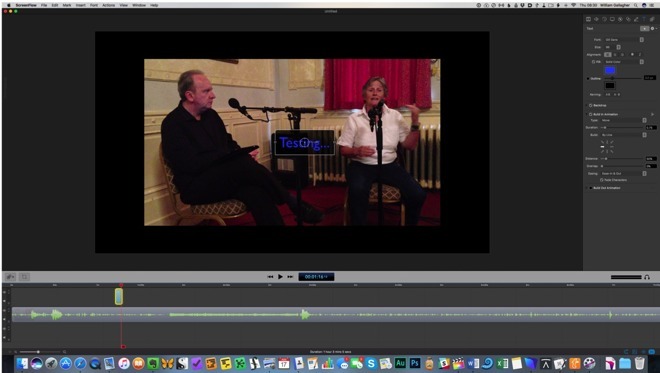 It takes your Mac or iOS screen's recording and helps you produce broadcast-quality video with it. You can use this to just show a relative which is the Send button in Mail or you can make a detailed tutorial for colleagues on what to do when Microsoft Word crashes on you. As you show them your screen, you can zoom in on a button, draw an arrow, write a text note-on screen - and also record your voice describing the action. You can reverse the recording: show someone a before and after by rocking the video back and forth. 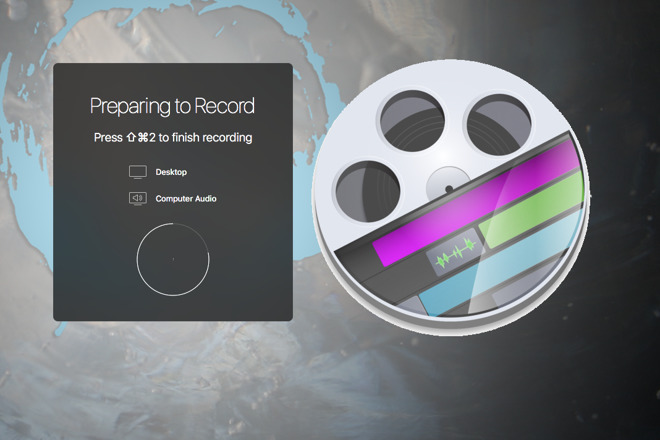 You can also drag in video or audio of any description, not just videos of Mac screens. 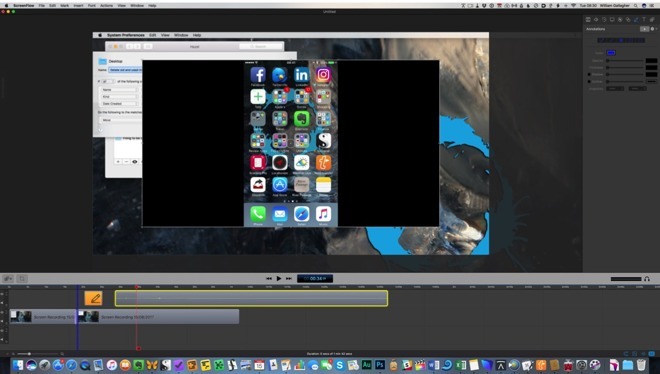 So if your friend or client is familiar with one app but not another, drag in video of the one they know and then cut between that and the new one. Or if you think they'll nod off after a mere seven-hour guide to using Excel, interrupt it all with a video interview or a trailer for your exciting Outlook movie. ScreenFlow used to solely capture the screen of your Mac, and then later of your iPhone or iPad, but now with version 7 it's got full video editing capabilities. Don't buy it to replace iMovie and definitely don't buy it to replace Final Cut Pro X or Adobe Premiere. Buy it when you want to record your Mac's screen a lot. Apple's macOS already comes with a way of recording the screen using QuickTime Player. It's a historical oddity that an app called a Player is also a recorder and that does tend to stop people from finding it. Just the same, it will record your screen and if you plug your iPhone or iPad in to your Mac, it will record those instead. ScreenFlow lets you select just a segment of the screen, though. You can record the lot and later on zoom in, or you can say you just want a portion of the screen. It also lets you record on a timer. It's hard to think why you'd want it to switch on and record your Mac over lunchtime, but you can. If you're showing someone how to render images and export them from, say, Final Cut Pro X, you could leave ScreenFlow recording to the end without you sitting around. 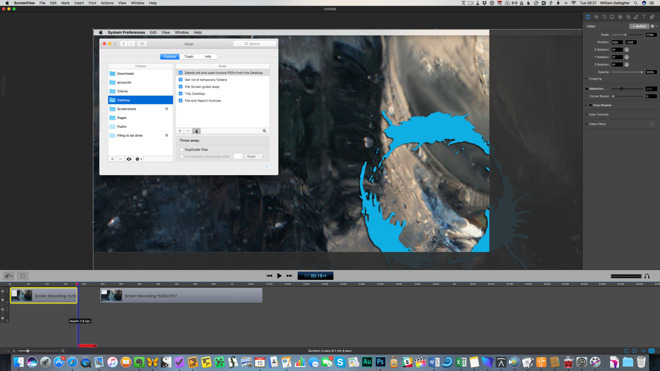 Then you could do that sequences shortened trick of cutting from the render beginning to it ending. Equally, you can add a giant arrow pointing to the progress bar and label it on-screen with some cutting remark about your needing a faster Mac, please. The thing is, though, that you're not going to go to all this effort if you only want to make a video to stop your aunt in Cleveland from phoning you every week. You're going to go to this effort and you're going to use all this functionality if you're doing this seriously, if you're doing it professionally and most of all if you're doing it a lot. In that case, one of ScreenFlow 7's new features is going to be particularly welcome. You can now create a library of items that you use often, like your company logo that you want to slap over the start of a video. It can include all the images and video clips that your CEO has approved. Previously, you could keep those somewhere and drag them in to each project but now it's all available to every video without you having to hunt. Also to help you find things, there's now Touch Bar support for MacBook Pros which brings commonly-used controls to your fingers. Besides just editing, version 7 is also about speeding up what can be sped up. So alongside the Touch Bar and library of shared elements, there's also more setting things up once to use forever. So when you first connect a microphone, for instance, you can adjust its balance to decide just how you want it to sound on this video and then that's it for all videos. Or at least until you next choose to alter it. Similarly, export options including a new ability to save to Box.com and Imgur.com with preconfigured settings that you only have to alter if you want to. ScreenFlow 7 is serious, powerful software and the more you do this type of work with it, the more delighted we became with the app. From small touches like a new dark look, to significant improvements like video editing controls, this is the type and quality of software that you want to work with. We'd argue, though, that Screenflow 7 is also severe overkill for when you just want to record the screen for a second. When your needs are simple and rare, stick with macOS's own method. With long recordings, Apple's built-in solution stutters and drops frames. It was noticeable enough that we had to re-shoot segments when we did it with QuickTime, but so far we've not had even a flicker of a problem with ScreenFlow 7. 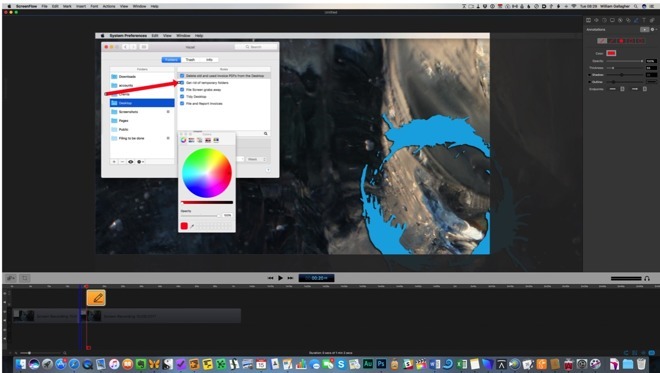 ScreenFlow 7 costs $129.99 on the Mac App Store or the same price direct from developer Telestream.